The Vanuatu is a group of 83 islands in the southwest Pacific Ocean southeast of New Caledonia and northwest of the Fitzi Islands. It is an independent democracy with indigenous populations. The N. Vanuatu inhabitans are peaceful and polite people. Until 1980 the Vanuatu known as New Hebrides was administered by France and in cooperation with Britain as a condominance. Some of these islands are the home of some really primitive people of the South Ocean. 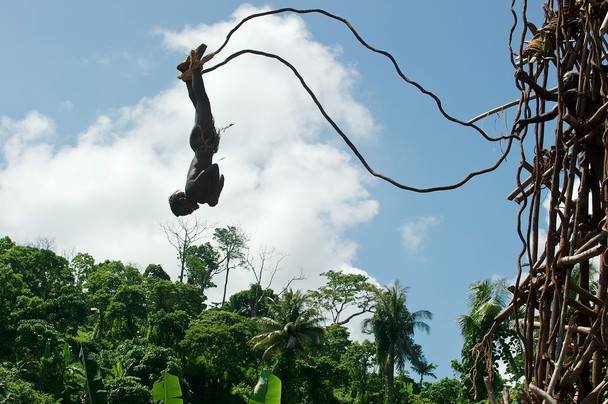 Deep in the jungle is the fifthieth island are found the roots of Bungy jumping. It is there where the ritual Nagol has been conducted for centuries since many years ago. 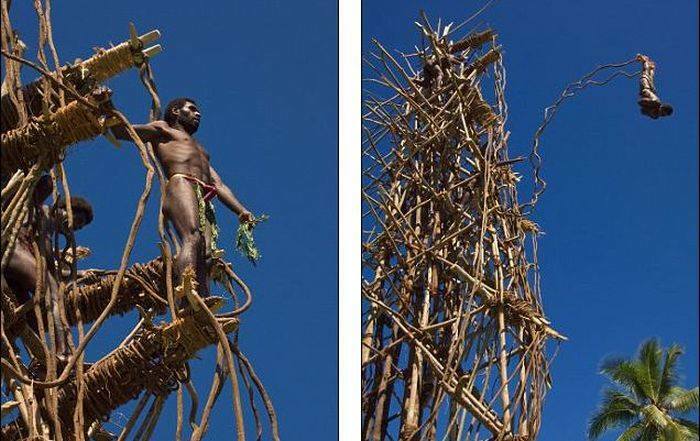 Every year in April when the first crop Yam is ready the inhabitans of the south side of the island start and build a huge tower to dive into the earth. The creation of the Tower takes five weeks the materials from roots and tendrils with fibres of lint Each one of the “jumpers” choose the materials “equipment” of lashing, on his own. All the men as well as the young boys get on the Tower and get ready for the jump as a sign of manhood, bravery, courage and power. The ritual of “nagol” is a unique and special event that takes place in these areas.